Well, we made it to the end of our first One Room Challenge, and I am SO glad we did it. It was exhausting: 2 am has become our new normal bedtime. And it was a tad stressful at times. But, we worked hard as a team, and I am so proud of my husband and the skills he honed along the way. I'm also proud of us for setting a goal and sticking to it. We tend to meander our way through projects around here (I'm looking at you, uncaulked & unpainted crown molding installed 6 months ago in our daughter's room). It's amazing how much you can accomplish when you don't binge watch a show on Netflix. For those dropping in for the first time, we committed to making over our laundry room, mudcloset, & garage entry, and we turned a pantry into an office nook in the kitchen hallway. You can see our intro here, design plan here, and play catch up here, here, and here. Linda of Calling It Home created this wonderful blog program, a 6 week exercise in design (& a little insanity). It was so fun, and we've already come up with ideas for at least 3 other rooms. I'm not sure we will participate in 3 more ORCs consecutively as budget does play a huge factor in timeliness. But, I am sure we will do this again, and hopefully soon. Ok, enough talking. On with the pictures. As a reminder, here is a before shot of the laundry room. We painted the walls, stenciled, and installed beadboard. 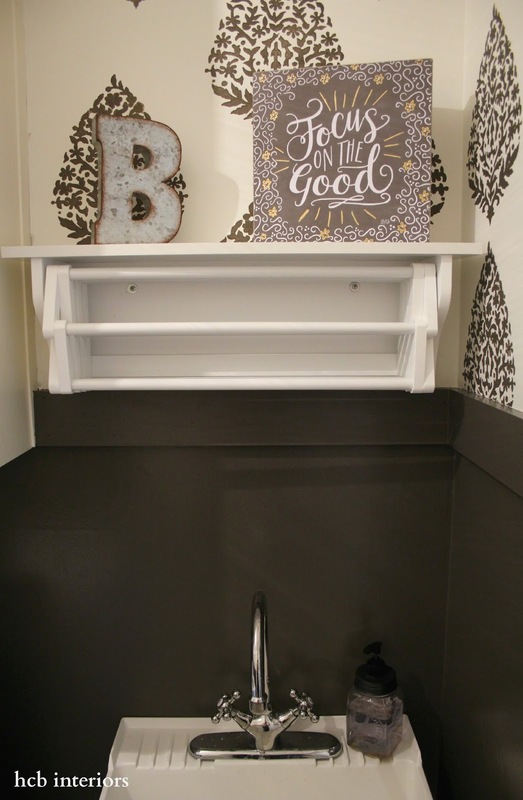 We also installed new hooks, cabinet pulls, an accordion-style drying rack, and a wall-mount utility tub. This last one was important because the legs of the old sink pushed the dog's bowls out into the doorway - now we can actually close the door. Hooray! We scrapped the idea of shelving over the drying rack & washer/dryer. I may go back and add that in later, but I wanted to get a feel for the use of the space before adding more clutter into this small room. This space is so tight that we had to forgo the beadboard on the back wall. That tiny difference in depth was enough to cause the new sink to stick out into the doorway. So, we painted the drywall to match the beadboard, and kept the top trim piece to provide continuity. I'm pretty excited that this new drying rack won't smack me in the head each time I use the sink, unlike the previous rack that was way too big for the space. 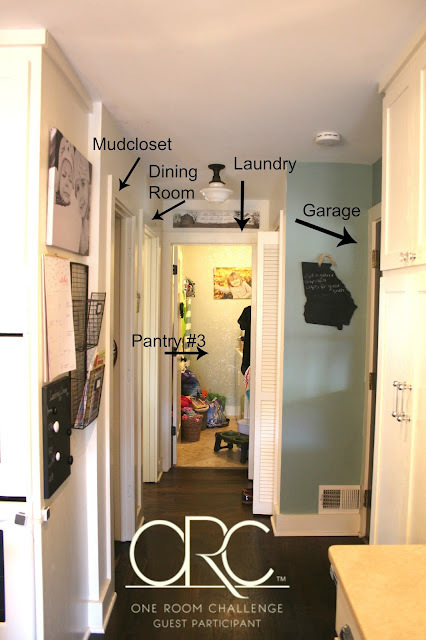 Up next is our "mudcloset". This space is only 36" wide by 10" deep. So not even a full foot of storage space depth. Argh. But, it is better than the option of walking across the house every time you need shoes or a jacket. 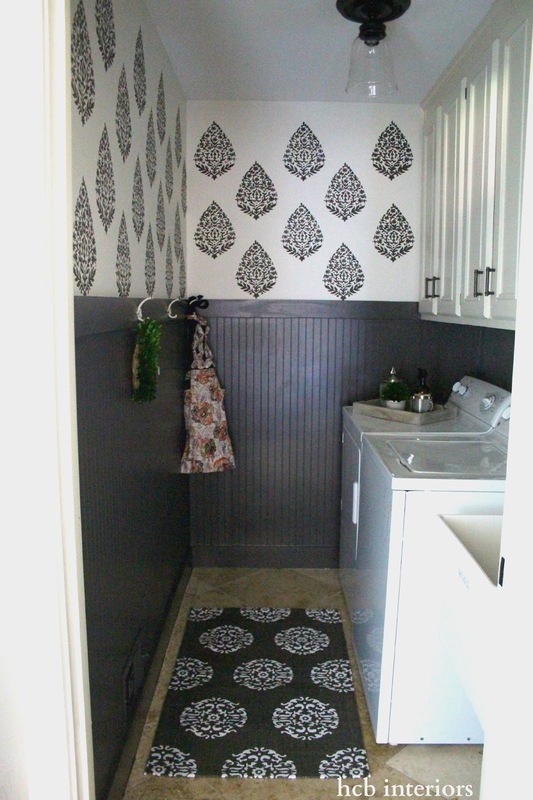 I had planned on stenciling the walls of the mudcloset to match those in the laundry room. But hours of hard work ending in imperfections and frustration convinced me that easy-to-install beadboard might be a better choice, and it is definitely more durable against wet jackets and muddy shoes. We also removed the inefficient top shelf, added more shelving/shoe storage at the bottom, and raised all the hooks so that our jackets weren't completely covering those of our girls. Now on to the office nook. This was a random idea I threw in at the last minute, after we had already decided to tackle the other areas. Luckily, hubby was game to try his hand at building a floating desk, and I am SO proud and impressed by his talent. Time and space constraints prevented us from building the cubby system I had originally designed, but I think this one is a suitable replacement. I love the character the World Market sconce adds to the space, but the best part is my babies watching over me from the chalkboard wall. I adore looking at those precious faces while I'm working. And finally, a before and after of the whole space. After painting the slivers of wall next to the garage door white, we decided it was a little boring. A last minute decision (as in this past weekend) was made to continue the beadboard and trim out here, and I'm so glad we did. I think it really is the key to providing continuity between all the spaces. What a great space for an office nook and the floating desk is genius. I am sure you'll be spending lots of time here. You sure tackled a ton, but you made it through it. I think a deadline is sometimes what we all need. Good for you for committing to another ORC, it was so fun to watch your space transform into something that you love. Thank you so much Betsy! It was a fun (exhausting) experience. I so appreciate your support! Happy Friday! It looks great, Holly!! 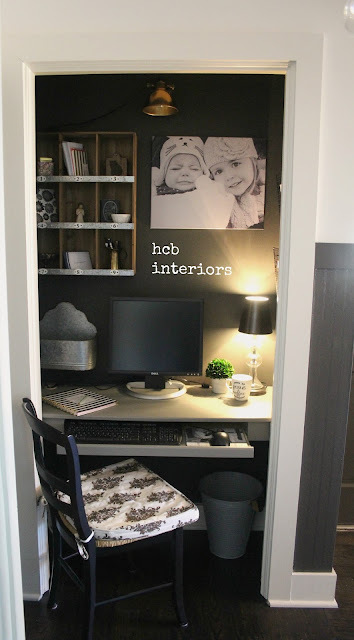 I love the black beadboarding with the stenciling and your little black office nook is awesome! Job well done. I'm impressed you did so much for your first One Room Challenge. Love the note about how much you can get done without binge watching netflix...I should try that sometime. Oooo, I love it! The dark trim and the stencil look amazing. Great job! Thanks, Erin! 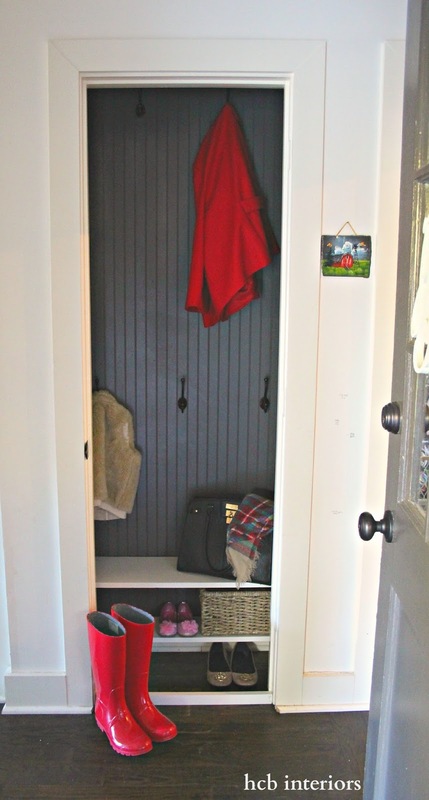 I adore your new mudroom! Love! The beadboard adds so much character, so glad you continued it on the walls near the garage. And the mud-nook is so great!! Um, the closet turned micro office is fantastic. Way to make a useful space and make it look so good!! I love the sconce you chose to go with! Thanks Lesley! We are really happy with how it turned out. Can't wait to see your room! I know it will be fantastic! great little office space! so glad you added that! Holly, I can't believe how much you accomplished!! How do you sustain yourself going to bed at 2AM??? Wow, you guys are the real deal! I'm a wreck if I go to bed after 11 PM! ;) My favorite is the breadboard, stencil and sink in your laundry room!! It's so quaint and charming. I also love your little office nook and the floating desk is awesome!! Congrats - you took on a lot and it all looks fantastic!! So glad we got to experience this together! Great job! I love the colors and the bead board. It will be so nice to do laundry in here! I'll be thinking of you while I'm battling the chaos in our laundry room...it NEEDS this kind of makeover asap! Congratulations on crossing the finish line! I love it all! The deep colors are so unexpected and gorgeous. Thank you so much, Stacey! The color was a bit of a gamble, but I'm really happy with it! Have a great weekend! oooh love it! that dark wainscoting is stunning! Thank you Cassie! It was fun to take a departure from white. Happy Friday! I Love when people put time into their "unseen" spaces. Looks great! I love all the colors you chose! Beautiful job! Thank you so much Sarah! Happy Friday! 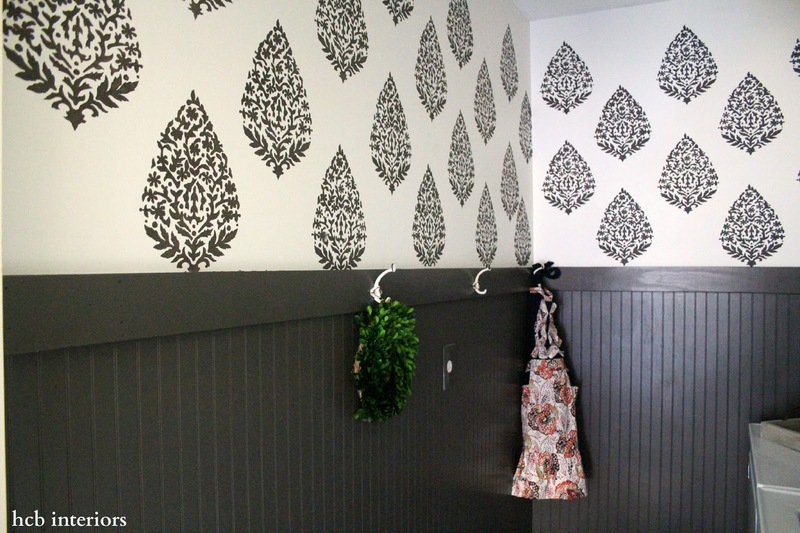 I seriously can't believe how much you tackled, especially with that huge stenciling job (I've stenciled before and know how incredibly long it takes!). Everything you guys did is beautiful! I totally get you on things that other people like but just doesn't feel like you. I feel the same way. Love the makeover. You killed it. Thank you so much, Ashley! I truly appreciate it! Everything is so cohesive and beautiful. Fabulous job! I cannot believe how much you did!!! I love the black beadboard! You did just an awesome job... in all the areas! Sorry, Erin, just seeing this! Thank you so much for your kind words. Happy New Year! 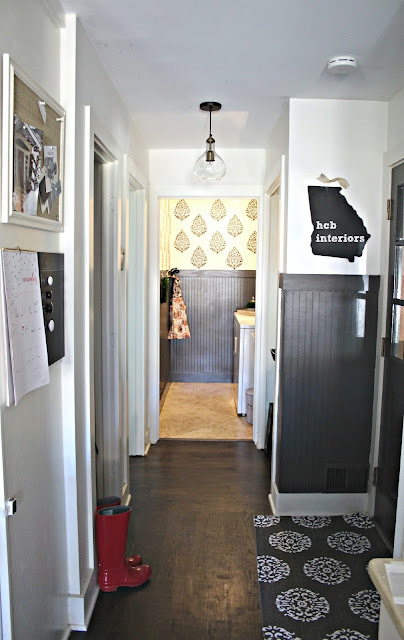 I love the stencil and adding the bead board was a great idea. It was the three room challenge for you:) Fantastic job! Thanks so much, Sherry! I've been following you for years, so I truly appreciate your comment. Happy New Year!